Woe is me. My beloved Mac has failed me. Friday morning, it decided to keep shutting itself down intermittently. So off to the Apple dealer I went with my baby, and there she sits on the diagnostic bench for at least five business days! Major inconvenience - an understatement. My husband's laptop is sufficient, but I'm not a huge fan of the PC, so it's not been fun. I have access to absolutely nothing: no photos, no files, no fun. And this also means no Mojo Monday for me this week. It's interesting what one discovers when they are suddenly without their computer. The main thing I discovered is that I waste too much time on mine. I'm enjoying quiet moments around here and not filling them with web browsing. Now there are certainly times when the computer is an extraordinarily helpful tool, don't get me wrong. I'd never give it up. For example, I had a consultant team meeting yesterday and was preparing our meeting agenda by hand! (3 pages) Then I had to drive to the library and make photocopies. Unheard of! I woke this morning and while I usually would go straight to the computer to check e-mail and then get distracted with attachments, store discounts, etc., I took Suki for a longer-than-usual morning walk, toss of the ball, and leisurely breakfast, all while hubby is off playing hockey. Daughter is still at the sleepover, so this meant a peaceful morning of absolute bliss while reading the Sunday paper and listening to the birds outside my front window. A leisurely shower, a stop for coffee, then to the grocery all before 9:00 a.m. Not a big crowd was shopping that early so it was quite delightful. And without my pre-teen alongside, I could softly sing and (God forbid) shake my hips as I shopped down the aisles. I return home to unload groceries, play with Suki and greet hubby home from hockey. Now is when I would normally be glued to my computer and not even getting up when he comes home, and throwing a ball to the dog without getting up from my computer chair. The three of us sit on the back porch and just talk. . . well, two of us actually do the talking. I run a load of laundry and look at a magazine. Finally, I decide maybe I should check my e-mail. Luckily I did because I discover that the home gathering I was getting ready to leave for in an hour has been cancelled. I guess the point of all this is while our computers are helpful and important tools, they are also fun and easy to spend too much time on; letting the simple pleasures of daily life slip past us. I've heard of those challenges where you should try to live through one day without any electronic devices and thought, "I'd never make it!" Haven't you? Well, I challenge you to try it for a day. It might turn out to be a pleasant surprise. Or perhaps you don't spend as much time on your computer as I do, and this has been a lesson just for me. Sometimes you just need a quick idea that doesn't have to be over-the-top, tripped out, with tons of technique and time put into it. I personally love these quick and simple projects. They are easy and best of all: everyone loves getting them! This little Tic-Tac treat holder was an idea I found online. 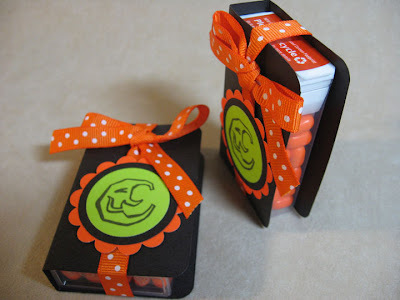 I made 8 of these cuties for my Cards & More Club members. It's incredibly simple . . .
• Cut a piece of cardstock 4 5/8 x 3 inches. • Holding it horizontally, score it at 2" and 2 5/8"
Not to plug Stampin' Up too much here, but until CTMH gets some punches and dies, I'm forced to go elsewhere, ya know? Anyway, this super fantastic Sizzix die of this treat bag is called "Bag with Scallops" (I get all my Stampin' Up stuff from my gal pal Grace Benjamin right here in sunny Florida.) The die is huge and works in my Big Shot. 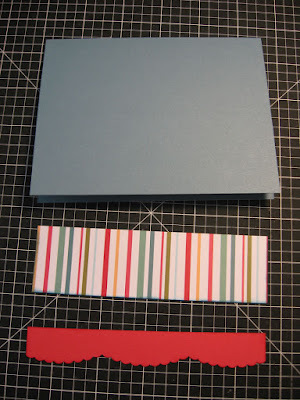 All you need is a 6 x 12 piece of cardstock and all the pieces are there for you. 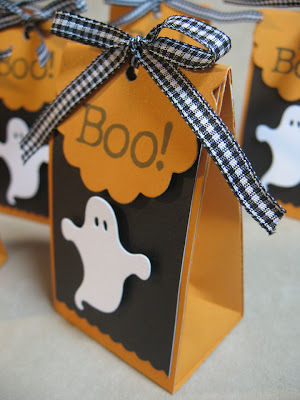 I added some black cardstock, a ghost (QuicKutz die) and some WalMart ribbon, plus the word Boo! 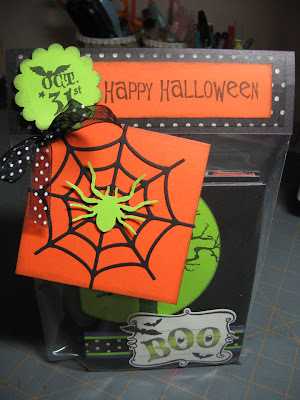 from CTMH's stamp set Creepy Cobwebs (D1319). I filled each one with a piece of Hershey's Extra Dark chocolate, a lovely Lindt Fioretto Cappuccino candy, and one of the new Via's from Starbucks. Grown-up treats! I love how they look in a grouping. These will be for my Cherish Club scrapbooking girls tomorrow night. We've all seen this before, I'm sure. It's an old favorite of mine. The popcorn treat holder. I've always liked this one for its simplicity and sheer cuteness. Look how easy . . .
• Cut a piece of cardstock 5 1/2" x 9 1/2"
I got inspired by a card I saw in last month's CardMaker magazine where they showed a stained glass technique. I experimented on my own and came up with this and thought I would share how it came together. A list of the supplies is at the bottom of this post. First, I wanted to stamp a simple background for the textured white cardstock area, but didn't want to simply stamp it straight on there, so I experimented with Twilight re-inker and a little water in a cup. 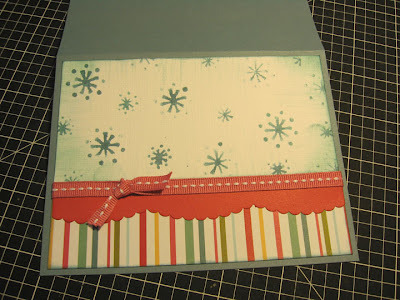 Then I dipped my stamp in there, stamped off onto scrap once, then onto the cardstock. It gave it just the right look. Sort of watery and cold. I used my stipple brush to sweep in a little more color around the edges, then finished off with my finger dauber and the Twilight stamp pad to darken up the edges more. You can click on the photo to see an enlarged view of the detail. 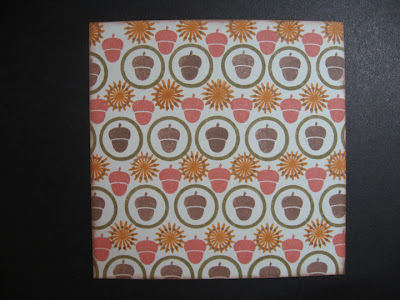 I used Twilight cardstock for the card base, a striped paper, then Tulip cardstock and my newest Martha Stewart border punch. I've had this box of laser printer transparency film in my desk for over ten years. I discovered that there is an emulsion side and a smoother side to this stuff. 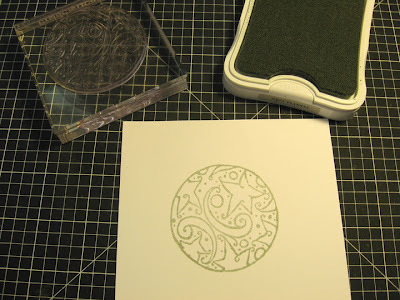 And I also found that you can stamp and emboss on the emulsion side for the best results. So I stamped the image with VersaMark, then sprinkled it with black embossing powder, heated that sucker up and voila! I was pleased. 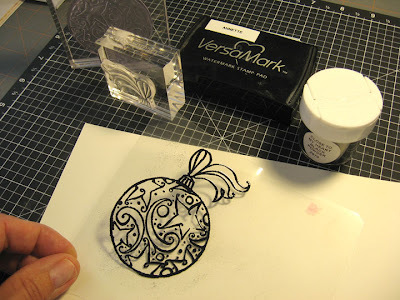 But then, I got to thinking how my paper choices didn't really work with that black, so instead I tried silver embossing powder and that did the trick. 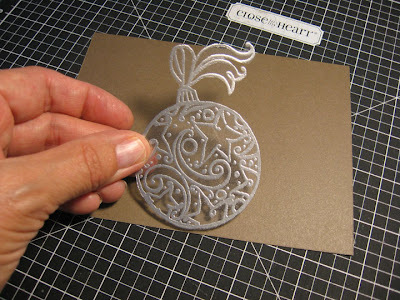 On a piece of plain white cardstock, I stamped the ornament again using a very light gray so it wouldn't show up too much. (Gray Flannel). 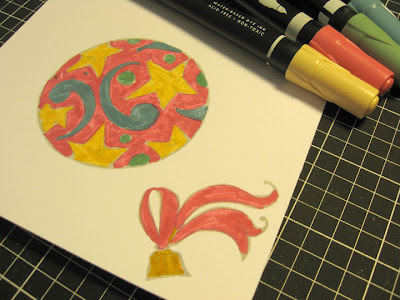 I colored in the sections of the stamped image using the brush tip of the markers. Here I used Hollyhock, Creme Brulee, Twilight, and Juniper. Notice I stamped the topper to the ornament separately due to the fact that it would be nearly impossible to get the same positioning as the one I embossed. I figured I can piece that later and the position will be right on the money. I cut out both the colored images and the embossed transparency and adhered them with Liquid Glass on the areas that wouldn't show through; under the silver embossing. Now that we have all our pieces, it's time to assemble the card. 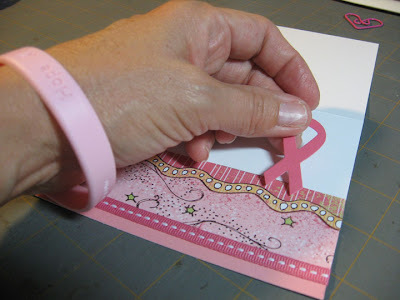 I added a Hollyhock ribbon across that piece of Tulip cardstock. 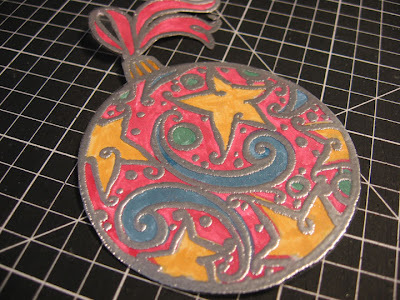 I popped up the ornament using foam tape which really gave it some dimension. 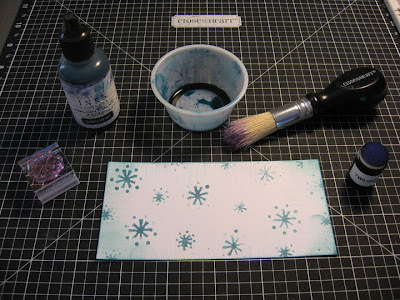 And as you can see, I stamped and embossed Merry Christmas in silver on the card, which I would recommend doing way back at the beginning after stamping the snowflakes and letting them dry. Believe me, I was holding my breath when I did this at the end. So, don't do as I do, do as I say. Thanks for looking! All items are from Close To My Heart and can be ordered on my CTMH website. What a life I lead! Most people dread Mondays because they have to drag themselves into work doing a job they don't enjoy. I, on the other hand, am one lucky girl because I get to wake up nice and early, get in a run before most people think about waking up, kiss the husband goodbye (poor fella doesn't exactly love his job) enjoy breakfast with my daughter, drive her to school, pick up my delicious coffee and return home to cook for the week. THEN, I get to create. 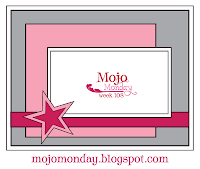 And Mondays are my favorite because it's Mojo Monday. Anyone can do this, so when you get the chance, you should check out their blog and upload your own card design. It's fun to look at all the different ideas that people come up with for one single sketch each week. This week's sketch is #109 shown above. And I got on this kick this past week with a stamp-and-repeat technique that I haven't tried in a while. For this Happy Fall card I used CTMH's Twitterpated papers (X7118B) and Connections stamp set (D1330) plus the Many Thanks set (D1371). 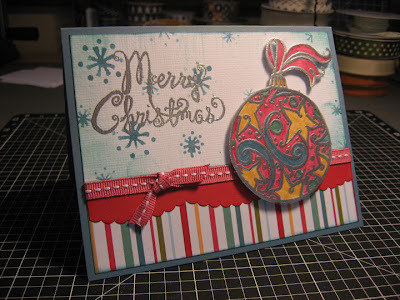 And finally, I was on a roll and had to try a Christmas card with this technique. 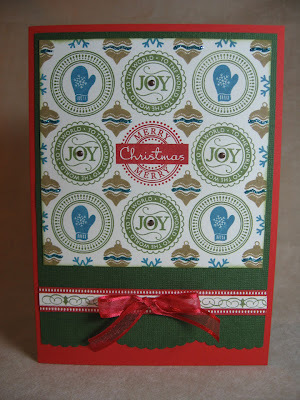 I used Just for the Holidays stamp set (D1380). One of my favorites. 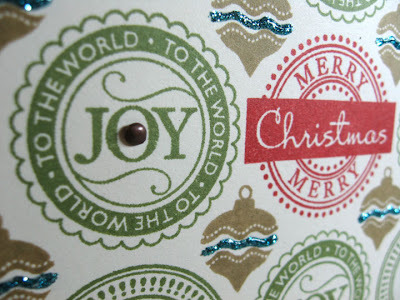 I added some of CTMH's bitty brads in antique copper in the middle of the O's in the word JOY. I am tempted to add something with some dimension to this and use it as our family Christmas card. We'll see... In the meantime, give this easy technique a try. 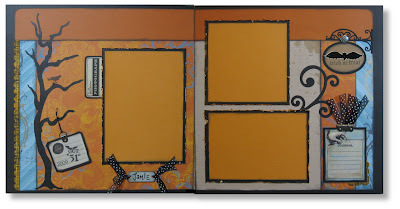 It works best with geometric shapes, both large and small mixed. Experiment and send me a Jpeg of yours and I'll post it on my blog. 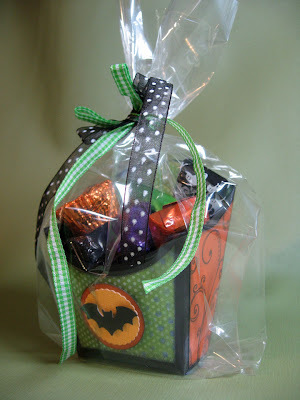 A little blog candy is yours if you do! 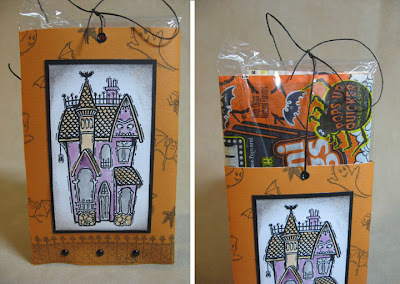 Charmin Hayes won my FREE Halloween Layout Kit in the random drawing from those of you who posted a comment here on my blog. Some of you had trouble posting on my blog and e-mailed me. (which works out fine until I figure out the problem) Here's the layout she won. Congrats Charmin! Cards & More Club - room for new members! 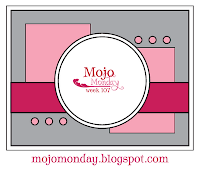 I have recently started a Cards & More Club where members meet once a month, agree to place at least a $25 minimum order, enjoy hostess rewards, and get to make three projects; sometimes cards, sometimes more! Here's what we're doing this month. The card above is called a Tri-fold Shutter Card and I've seen it on the web here and there a lot lately and had to give it a try. It folds flat to fit in a regular A2 envelope. 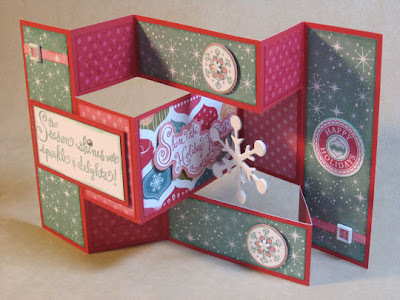 The papers are from CTMH's Jingle Level 2 pack, the stamp set is Holiday Warmth (D1376) which is the October stamp of the month, the accents are from the White Daisy Mini Medley accents collection (Z1136), and the dangling snowflake is chipboard from the Flurry Dimensional Elements (Z1225). This little treat holder is from a fry box template I've used a long time ago. But recently, I saw one in Creating Keepsakes magazine, and they provide a printable template from their website. So check that out if you're interested. Mine is a smaller version than theirs. 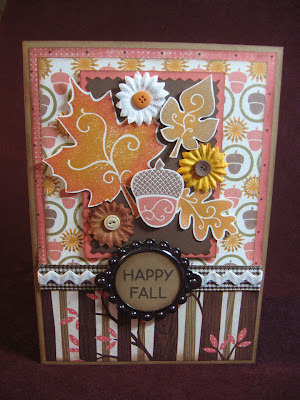 I used papers from CTMH's Stardust (X7109B), plus some Autumn Terracotta cardstock and Playful Flourishes stamp set (D1212). I think I've used this stamp set more than any other one I own. The final card is the same one I used for my Mojo Monday sketch challenge which you'll see posted below. I always appreciate comments, so let me know what you think. And by the way, my Cards & More Club has room for 2 more members if you're interested. Although I don't have a photo of them, I had eight lovely ladies come to my dinner crop this past Friday night. We enjoyed Singapore Style Noodles (Cooking Light, Oct. 2009) which included ingredients such as large shrimp, bacon!, red bell peppers, and green onions over noodles with a sauce that was spicy and delicious. On the side were my old favorite Green Beans with Garlic, and for dessert was a Tarte Tatin (also Cooking Light) which I had a little trouble with and had to practically pry out of the cast-iron skillet with a crowbar. I got a little carried away with the caramelization thing and it burned slightly. Nothing a little whipped cream couldn't fix right up. 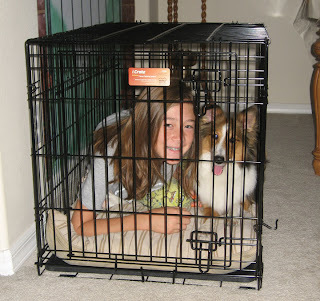 Saturday, Paul and I enjoyed a morning stop at Starbucks and then Petland to buy our growing girl a bigger crate. Evidently, our other growing girl also enjoyed it. I had nine more friends attend my Halloween Mini Album workshop on Sunday, and bless their hearts, they were here almost 5 hours! I can't speak for them, but I do believe they enjoyed themselves and were happy with the project. 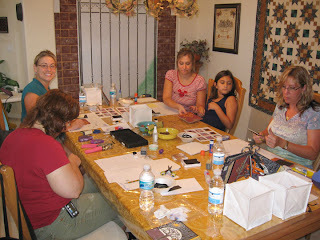 I made a few new friends in the process since it was a first workshop for Patty and Jen. I hope I didn't scare them off yet. And here we are at Monday once again. Cooked all day, cleaned up and started right in on my Mojo Monday card. This is sketch 108. Although the Florida temperatures are messing with my mind right now, I still am in the mood for Fall. 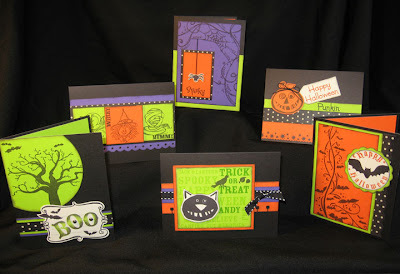 I got to enjoy a new Leaves embossing die from QuicKutz as well as an old favorite Revolution die called Pumpkins. The papers are from Close To My Heart and the Thankful stamp is also. 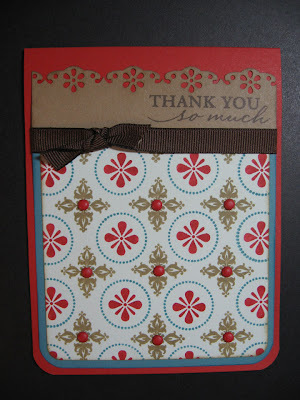 It's called "Give Thanks" (Item #D1110) and I just love that big Thankful in the set. It also includes other thankful phrases, pumpkins, cornucopia, and more. Check it out on my CTMH website when you get a chance. Over the summer, when I had far more time on my hands than now, I thought it would be fun to submit one of my card creations to a magazine. I had just purchased the Stamper's Sampler Take Ten issue (it's a nice thick catalog-style magazine that comes out quarterly, I think) and I love to pick one up occasionally for inspiration. I had just made a card for my friend Lisa for her birthday, so I duplicated that card and sent it in to Stamper's Sampler. That was months ago. I have since sent in another card design to them, because I figured they rejected that first one. Last week, to my delight, I received an e-mail congratulating me on being published with my initial card design. Naturally, I was thrilled! When you get published, they send you a complimentary issue of their magazine. I was equally thrilled because that quarterly Take Ten issue costs $15. I later discovered that my complimentary issue was their bi-monthly pub and not the Take Ten issue. But I am still happy, believe me. Of course, I did not take a photo of my card before I sent it, so if you'd like to see the card that got published, you'll have to pick up an Oct/Nov. 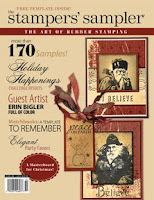 issue of Stamper's Sampler and go to page 9. Meanwhile, I'll see if I can get Lisa to take a photo of the one I made her. Mondays are busy days around here, but my goal is to always make time to do the Mojo Monday sketch. And this week is a special one because it's a contest! 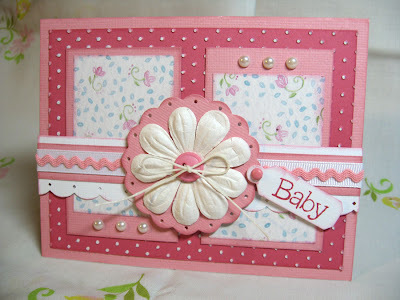 It's sketch #107 and since I needed a baby card for a friend, I decided that was going to be my theme. All products are Close To My Heart with the help of my Cuttlebug swiss dot embossing plate and my EKSuccess scallop and dot punch, plus my good old QuicKutz scalloped circle. I pierced those holes by hand on that one. Those cute little pearls are from CTMH's Connections Club. They come with adhesive backing and they really dress up cards and layouts nicely. Like I said, Mondays are busy and they truly are. I have taken on the role of personal chef/nutritionist to my in-laws since we moved them down to Florida three years ago. My father-in-law has kidney issues, so that means watching his diet, and my mother-in-law has no teeth, so that means soft and squishy foods. (Not that bad. That woman can eat a steak with NO trouble.) 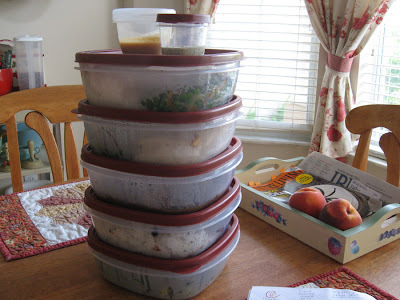 Needless to say, it still presents some challenges in meal planning. But by now I've got it down to a science. I spend the better part of each Monday cooking all their meals for the week, labeling them and delivering them with instructions for the 'fridge door. The kitchen is a disaster area by the time I'm finished, but man, it sure smells good in here! I whip up the dishes, wash the place down, and then collapse for a brief few minutes before I pack the car. All this, and check out what the queen is doing while I'm toiling away. That's our Suki. 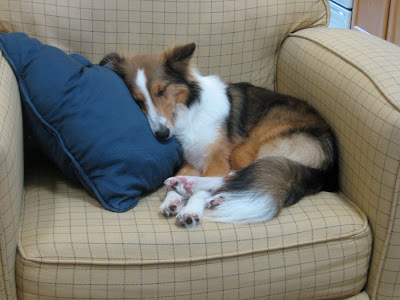 Our 7-month-old Sheltie puppy. Apparently she is most comfortable with a large pillow for that sweet face of hers. 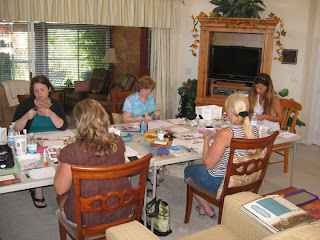 Each month I hold a card class at my home. 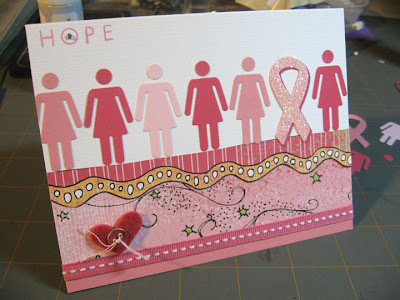 I kick my family out for a few hours, whip the house into presentable shape, and enjoy the company of ladies usually (but boy-oh-boy I sure would love to have some men join us once in a while) as we create a six-card set using Close To My Heart stamps, paper, and embellishments. Today was one of those Sundays and since it's October, Halloween was the theme. (Are you sick of seeing Halloween stuff here on my blog yet?) Here are the cards we made. Easy and fun. So much so, I sat and made another set myself. 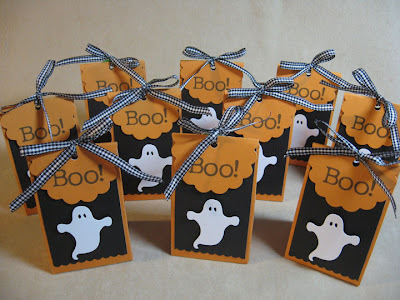 After everyone left, I packaged them up in a clear bag, put a topper on them, attached a card and left this little package on the doorstep of my neighbor Patty who is an even bigger fan of Halloween than I am, who couldn't make it to my class this month. Patty is the ultimate neighbor, always there to loan me a cup of sugar, literally, or her extra stamp pads when I have a big crowd coming. So, on the little card I wrote a note of thanks and like I said, le ft it on her doorstep. I didn't ring the bell or anything because I knew that she would soon be walking her dog Ralphie, my dog Suki's best buddy. Sure enough I got her delighted phone call shortly thereafter. Then we met up with our dogs and attempted to take them on a walk together. (They're both spastic puppies who are in desperate need of proper training.) We managed pretty well and went our separate ways. Patty was happy to get the cards, and I was happy to have a nice way to thank her for being a great neighbor. October is here and I can't help noticing pink everywhere I go. All the ads in the newspapers, the added merchandise in the stores, the postage stamps, and even the candy wrappers. Years ago, I have to admit I didn't pay much attention. But as I'm sure is the case with most of you, I have come to know more women than I would like to count that have been affected by breast cancer. At the grocery today, I went through my favorite cashier's line (Maureen) and noticed her pink rubber bracelet, and remembered that I too had one and promptly came home and proudly put it on. 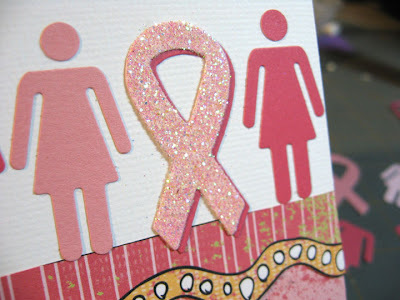 No, fortunately I myself have not personally been touched by breast cancer, but many women I know and love have been. When it finally seemed as though I could squeeze in some creative time into my busy day today, I sat and wondered what I'd like to do. As I flipped through my "Wishes" book for inspiration I looked down at my wrist and saw that pink bracelet with the word Hope looking right back at me. "How's this for an idea," it spoke to my imag ination, and off I went. The card itself is no masterpiece, but it was a pleasure to make. As I laid each little lady down to the white textured cardstock, I thought of the different women in my life . . . Shari, Patty, Jody, Sue, Shelly, . . . each of them has made it through. L ost their hair, their sharp memory from time to time, their breast(s) in some cases, lymph nodes removed, hot flashes acquired, and probably a slew of other things of which I am not even aware. All I know is that they are still here and I am lucky to know them. Here is the card completed and I hope if you have been affected, you take this as my personal nod of my cap to you, my friend.